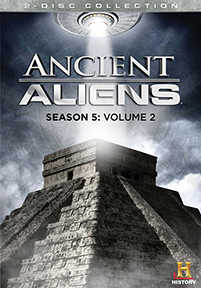 Season Five Volume 2 of the History Channel’s popular television show Ancient Aliens investigates the topic from many angles. “Emperors, Kings and Pharaohs” explores whether ancient leaders, usually attributed with divine powers, were actually connected to extraterrestrial forces. “Alien Operations” examines advanced medical procedures practiced in the ancient world, as evidenced by wall carvings and skeletal remains. Did these skills come from an otherworldly source? Archaeologists ponder the healing power of ancient objects like sacred bones in “Mysterious Relics” and luminous, skull-shaped crystals in “The Crystal Skulls.” Do these controversial artifacts hold the secrets to the universe? And were giant-winged deities known as Anunnaki responsible for ancient Sumerian leaps in advancement? Find out in “The Anunnaki Connection.” This provocative collection also includes “The Satan Conspiracy,” “The Power of Three” and “The Magic of the Gods.” Includes interviews with David Hatcher Childress, Giorgio Tsoukalos, Erich von Daniken, Mike Bara, William Henry and many others. Includes: The Power of Three; The Crystal Skulls; The Anunnaki Connection; The Magic of the Gods; The Satan Conspiracy; Alien Operations; Emperors, Kings & Pharaohs; Mysterious Relics; more. Also available in Blue Ray. ANCIENT ALIENS SEASON FIVE VOL. 2, 2-DVD Set. 352 Minutes. 2 DVDs in Box. Extras.